Cameroonian Catholic Christians in the Washington, DC, Metro Area are launching festivities to mark the tenth anniversary of the founding of their community of worship. Celebrations are set to span an entire fortnight: from October 15th through Sunday, October 30th, 2016 and the theme chosen for the festivities is "Let there be Light." Drawing inspiration from the biblical line 'Let there be Light' but keen to go beyond Sharing the Word, the main goal of the celebrations is to mobilize funds to provide small solar-powered lamps to remote parishes in Cameroon. The provision of solar-powered lamps is intended to encourage Cameroonian Catholics in Washington, DC, Metro Area to go beyond the scriptural call for Christians to share the Light of Christ. Financial support is also being envisaged to support a few orphanages and to extend scholarships to seminarians from poor families currently undergoing their priestly formation at the Major Seminaries of Bambui and Mamfe. "It feels like just yesterday," said Lambert Mbom, one of the founders of the community, reflecting on how swiftly the ten years have come and gone! "Ten years have passed like the wind." "It has been a remarkable journey, overflowing with blessings from that very first day when our first Holy Mass was said in the Crypt Church, situated in the basement of The Shrine of Immaculate Conception in Washington, DC". Lambert reflects. 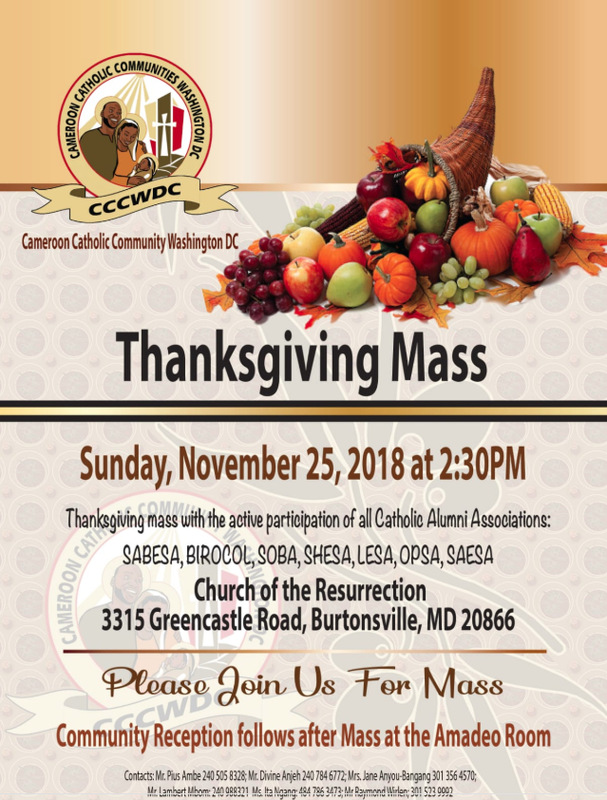 The Shrine of Immaculate Conception may be the birthplace of the Cameroon Catholic Community of Washington, DC (CCCWDC), but it is at the Resurrection Church located in Burtonsville, Maryland, that the CCCWDC has been breastfed and nursed through its toddler years to the age of ten. "We would like to make this a special time for sharing our gifts and love with each other; for pondering our commitment to sharing God's love; for celebrating and memorizing what we have been blessed to achieved so far," said Emma Osong, one of the co-Chairs of the Steering Committee charged with organizing the festivities. The main event of the celebration will be a pontifical High Mass - Cameroon-style - scheduled to hold on Sunday, October 30th, 2016. Organizers insist that this will not be another celebration for celebration sake. "The only reason we are organizing a celebration," said Pius Ambe, current Chair of the CCCWDC "is to offer another opportunity for our members not only to become more aware of their blessings, but to use these to bless less fortunate Christians in communities across Cameroon where we grew up". Funds for implementing the mini-solar projects will be raised from, among others, through individual and corporate donations and sponsorship of various events. Some of the income will come from a special raffle; the organization of a retreat and of group celebrations of the sacraments of baptism, communion and holy matrimony; as well as through money raised as part of an awards gala billed as the closing event of the celebrations.